Home > Research > BitCoin (BTC) for 2018 - New Major Price Pump Incoming? The old grandpa of cryptocurrencies BitCoin with it’s BTC token is still as strong as ever and as self regulated as ever, despite a lot of taxes imposed by the government, immensely large token transfer times and of course, the already monopolized mining difficulty. The self-regulating crypto, which started out as a way to exchange money anonymously without the banks having to have a say in it has slowly been devaluating after it reached it’s all-time high of $19,382, and proportionally to that, the investors’ trust in cryptocurrencies has begun to steadily decrease. But this does not mean that cryptocurrencies and the idea of self-regulating crypto-money is gone, because with the appearing of Ethereum and other tokens, the technology has begun to take shape in realistic ideas that can help solve real-world problems, related to different aspects of technology. So with BitCoin growing older and older, many do wonder is Spring of 2018 going to be an insane boost of it’s price just before all of the tokens and cryptocurrencies become independent and not dictate their price based on it? Or will BitCoin keep declining like it has been doing for the past 3 months? 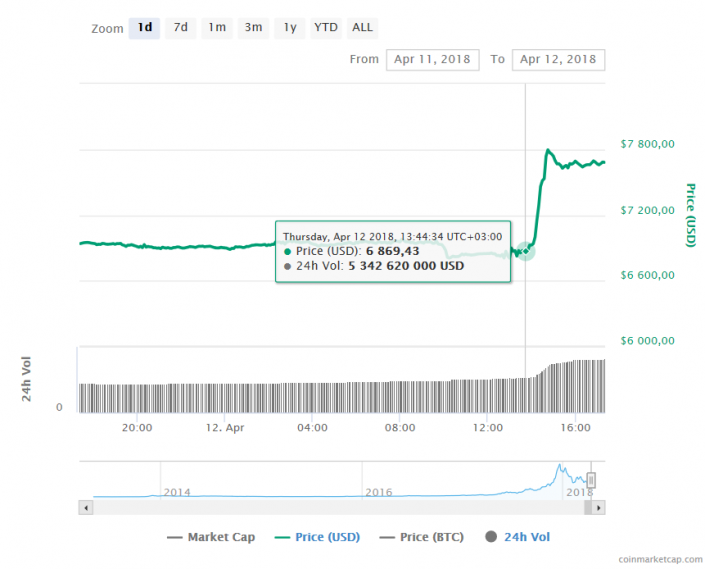 For the past 24 hours (12th of April, 2018), we have seen an insane pump in BitCoin’s price, from 6,869 USD all the way up to 7,795 USD in less than an hour time. 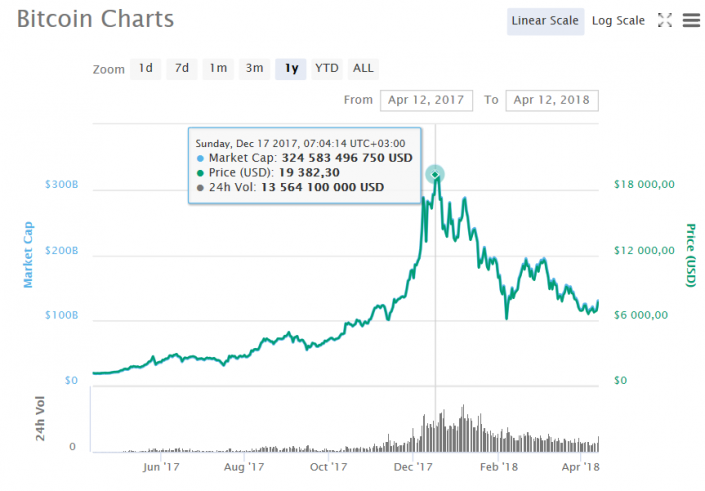 This does hint of a massive investment wave being performed to the crypto, which turned out to be true, given that it’s 24 hour volume quickly rose with around 2 billion and 173 million USD at this time-frame. And while the price has stabilized once more, many do believe that it is likely to see another jump really soon, which does hint us a lot about other tokens, whose price directly depends on BitCoin’s price. And the main detail here is that if the interest in BitCoin is high, this likely means that the overall interest in cryptocurrencies investments and mining also increases. Trading drugs and other illegal possessions. Extorting people with malware, such as cryptoviruses infections that hold your files hostage, asking for BitCoins. Once this has been proven to work effectively, what better marketing there is to want when it comes to BitCoin, but the fact that it simply works and it’s just like cash. And while crime will not stop, it has now become "globalized" and can be done from all over the world, as long as someone pays. This and other concerns has caught the eyes of authorities, catching a lot of scamming tokens, like the One Coin and others similar to it. And while the technology is still going crazy, many do believe that regulations and crypticurrencies trading ban in the US has affected BitCoin’s price a lot. And when we take a look at the technology itself, BitCoin did have some bugs in it too along the way, allowing hackers to generate coin transfers via loop methods that keep filling up their wallets as long as they do not exceed a certain amount, after which the wallets did empty out and they had to start again. This “hack” of BitCoin’s code and it’s SHA-256, did quickly get fixed and the coin with the 21,000,000 total mineable coin quickly became popular. It’s value did increase to almost 20,000 dollars as a result of a lot of hype, but soon after this happened, the domino effect begun to take effect in January, following investor fear and concerns and BitCoin’s price has been devaluating steadily ever since. And with the emerging newer and newer generation tokens, like Ripple’s XRP and EOS, many do question the pioneer of cryptocurrencies’s ability to stay strong in these vital times for accepting blockchain into our lives. But when we forget about the bad things happening on the crypto world, the BTC token has seen a sharp increase and it’s higher and higher 24 hour volume may be a hint of another massive pump about to come. The questions here remain if this pump is a prerequisite for something major about to come in terms of price boost of BTC, and if this is a bull attempt to exit a balloon which is about to be popped. Being a highly volatile asset, it is difficult to predict, and if you are and investor, always follow the latest developments in the tokens you are interested in.